What's more comforting that a bowl of potato and bacon soup on a chilly day? 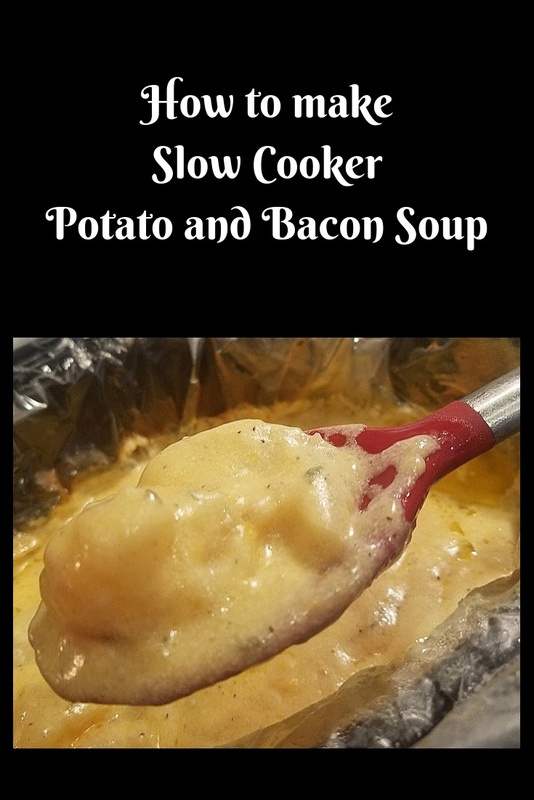 This is so easy made in the slow cooker. The best part is not only is it easy, it's done in around 2 to 3 hours. While you go out Christmas shopping, turn this big pot of soup on and it's waiting for you after a long day. 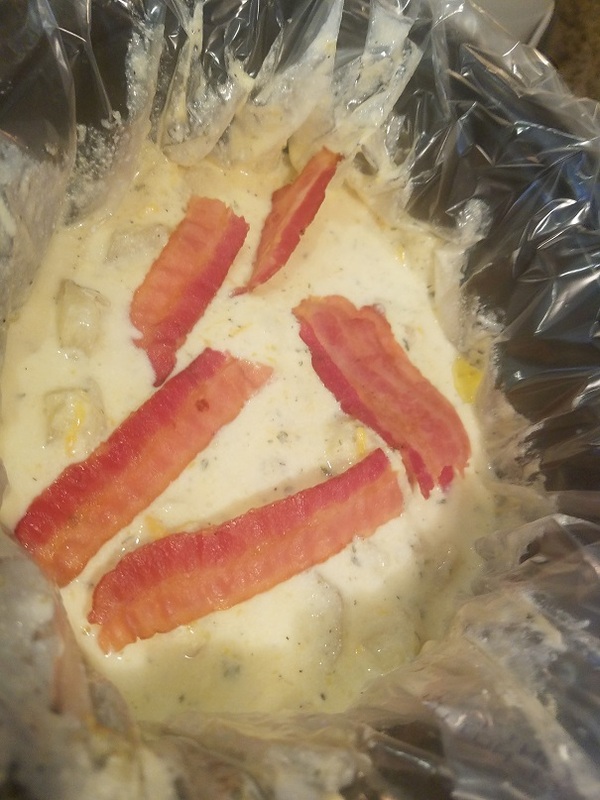 Kick back and stroll through this delicious easy recipe that is a hearty bowl of rich thick creamy bacon and potato goodness. So Thick It's Almost a Side Dish! 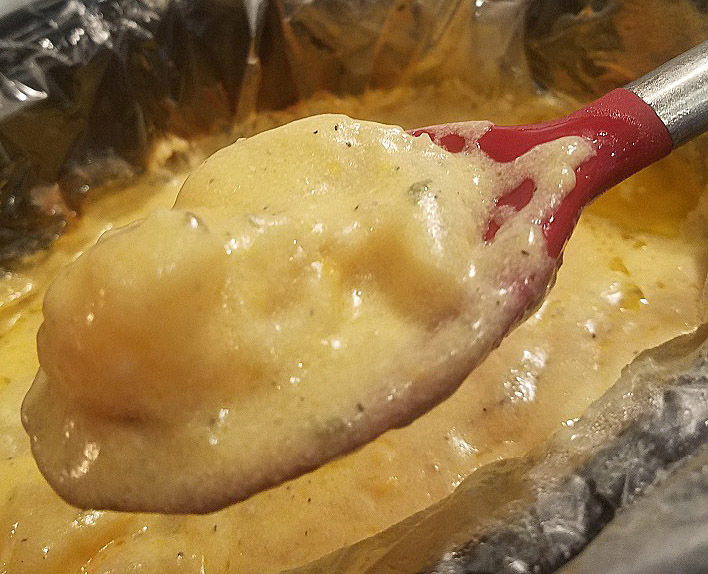 This is a very rich soup with so much cheesy deliciousness inside this slow cooker. I was amazed how filling it is but we often use this as a side dish with chicken or fish. It is that thick to be just like a cheesy scallop potato side dish. This is a seriously creamy rich soup that every potato loving person will love. That spoonful is so thick it stick to the spoon. Can you just taste that cheesy wonderful sharp cheddar just by looking at it? 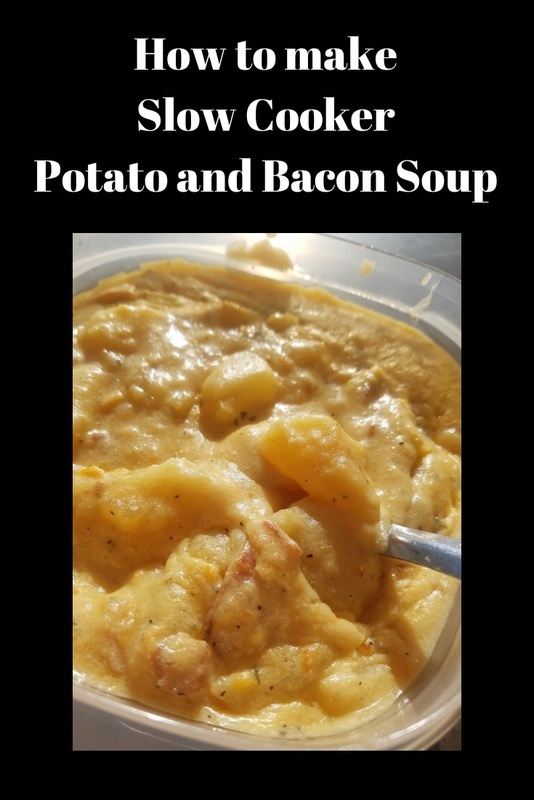 Don't miss trying this great potato bacon easy soup. The cream cheese makes this super creamy and the shredded cheese gives it the flavor. Paired with bacon this is a winner all the way and the kids will love it. I love a loaded baked potato, this slow cooked soup reminds me very much of a loaded baked potato. This Bacon and potato soup really doesn't need anything else added, however you can serve this with crumbles of blue cheese on top or even some sour cream. I like a loaded baked potato soup and this one is hearty and loaded for sure! There is no rule on how much cooked bacon to add, we love it. The rich smokey flavor of apple wood bacon is our favorite to use, you can also substitute ham if you have leftover spiral ham. I have a smoker so we sometimes make our own bacon out of pork belly or smoke a pork tenderloin, I have also used leftover smoked pork. Don't be afraid to adapt this recipe and make it your own. 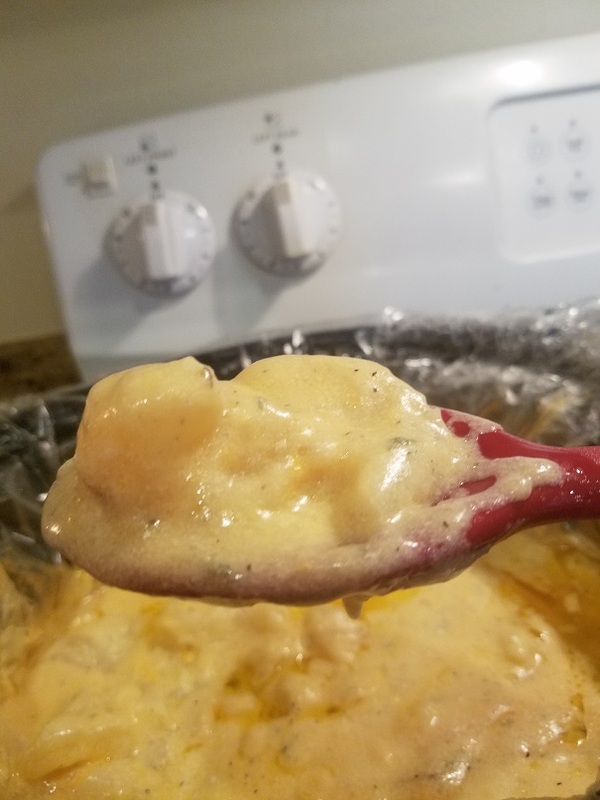 This is a basic cream soup that anything goes! Awe yes, this is the secret of it cooking so fast. I microwave the potatoes first, or if you want to boil them that's fine too. Just until they are slightly cooked but still firm so they cut easy. Cool the potato first under cold water then slices and make them into chunks. 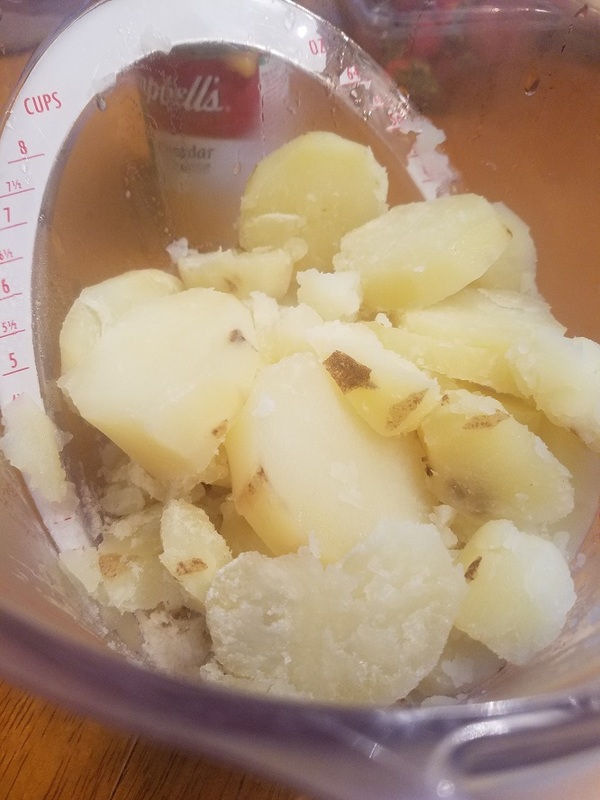 Even if you over cook the potatoes, it will still taste amazing! 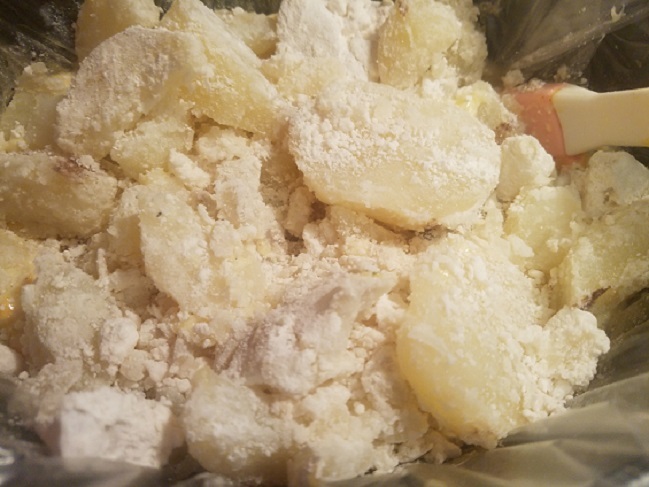 I add the flour into the cut up potatoes and toss them gently to coat, this will thicken the soup perfectly with no lumps. If this isn't the easiest soup recipe ever, I don't know what is and better than any tasting soup you can buy out there. This is your preference, I dislike the skins, I hate chewing on them. I know all the vitamins are in the skin, so you can leave them on but I remove them. Don't you just love slow cookers? Well I sure do. Easy peasy meals, set it and forget it. 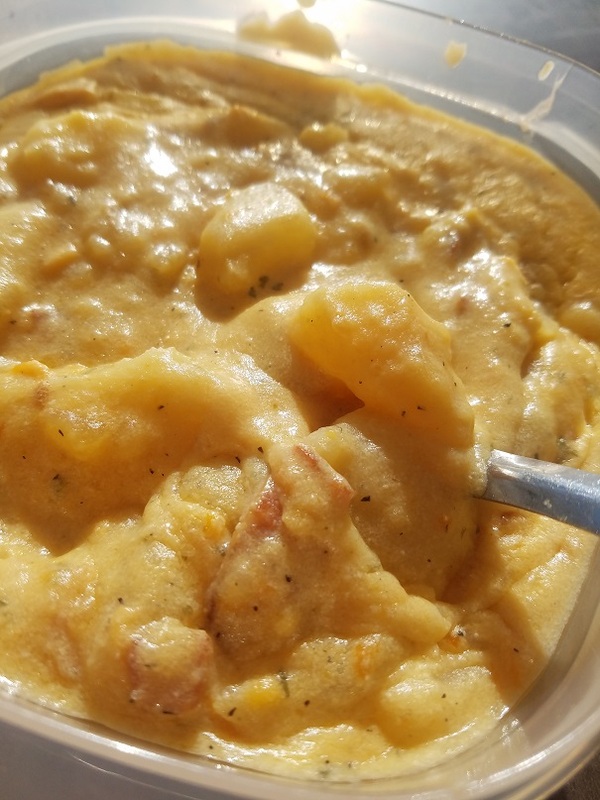 Throw all the potato ingredients in the pot and like magic you will have the best bacon and potato soup on the planet. 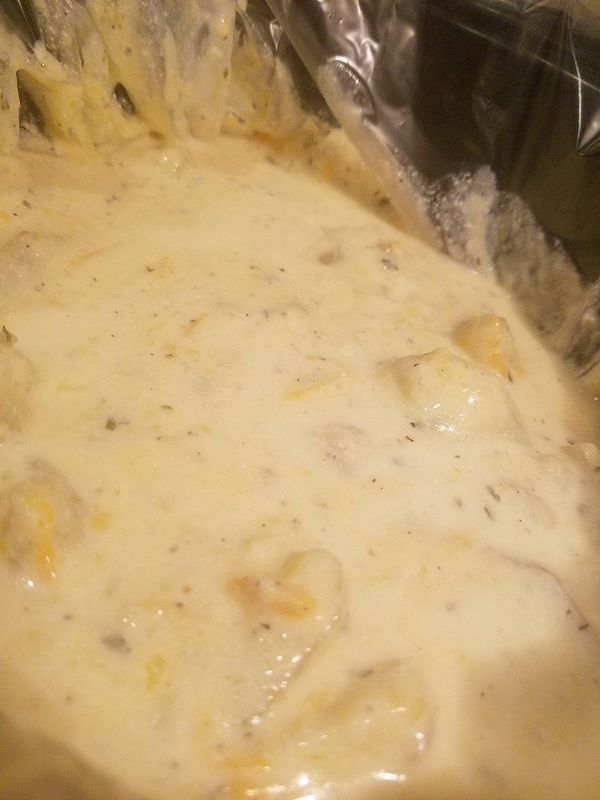 If you are a potato lover, this will hit the spot on any cold day and warm you up it's so creamy. 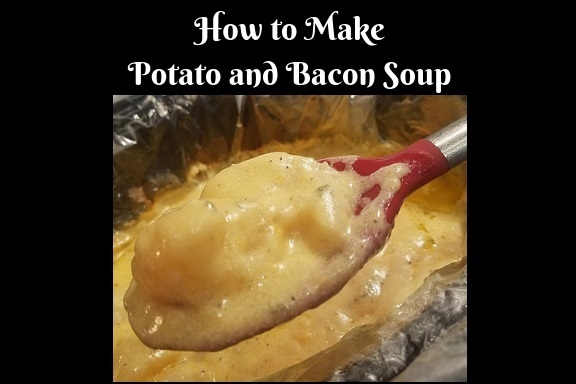 This potato an bacon soup will be a hit in your home just like mine and they will ask for it often, there are never any leftovers! 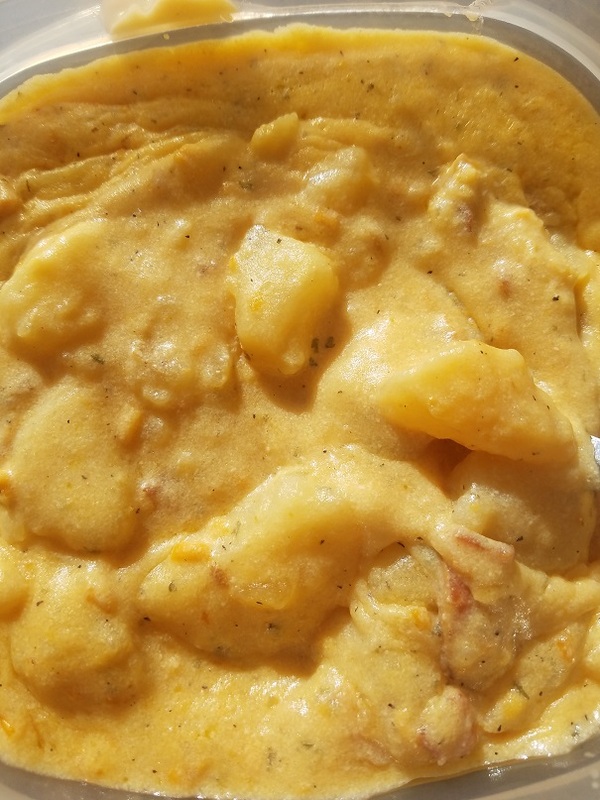 This is a rich thick soup make with potato in a creamy sauce with bacon. Heat the slow cooker on high and oil spray your pot. 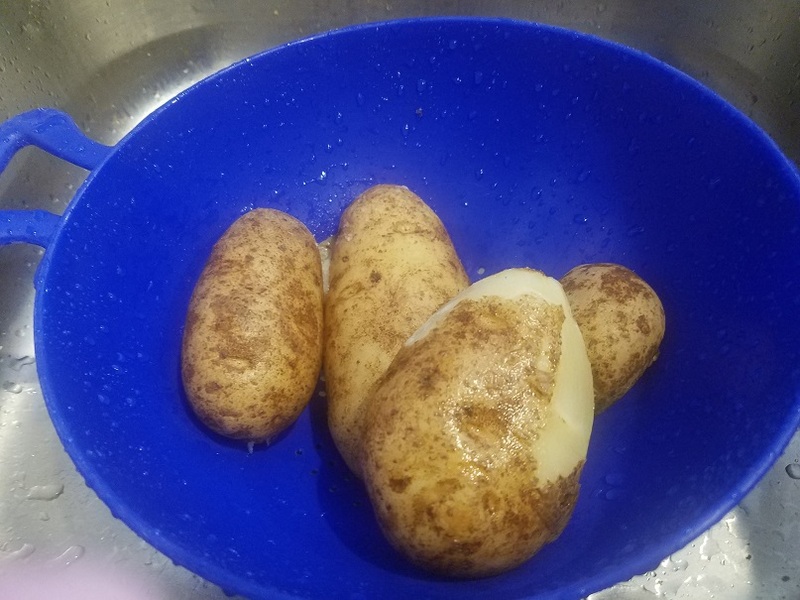 In a large bowl add the potatoes and toss them in the flour with garlic powder, salt and pepper. In another medium sized bowl, add the milk, soup, and parsley stir to combine. Starting with the potato add a few to the bottom, pour some of the soup mixture, sprinkle with half the shredded cheese and half the cream cheese. Repeat with potatoes, soup, cheeses until everything is used. Top with bacon. Set the slow cooker on low for around 2 to 3 hours. Check and make sure potatoes are soft enough. Ladle into bowls. This reminds me that I've been wanting clam chowder and with cold weather coming tomorrow, I think it's time. Perfect soup recipe for today's weather in Houston. Yummy!!! If I don't make this soon, I'll hate myself. What lovely additions to a clam chowder, Claudia! Ok, I am making this one. I was just thinking I miss clam chowder, haven't had it in years. Dear Claudia, I love creamy clam soup! This is a perfect combo. Howdy darling! This soup sounds wonderful. It has been so hot lately during day time over here and most nights came pouring rain and yet still very warm out side. Hope everything went well on your side. This would be perfect for an open house where guests could serve themselves. Looks fantastic! This is perfect for the winter season! Looks so creamy! 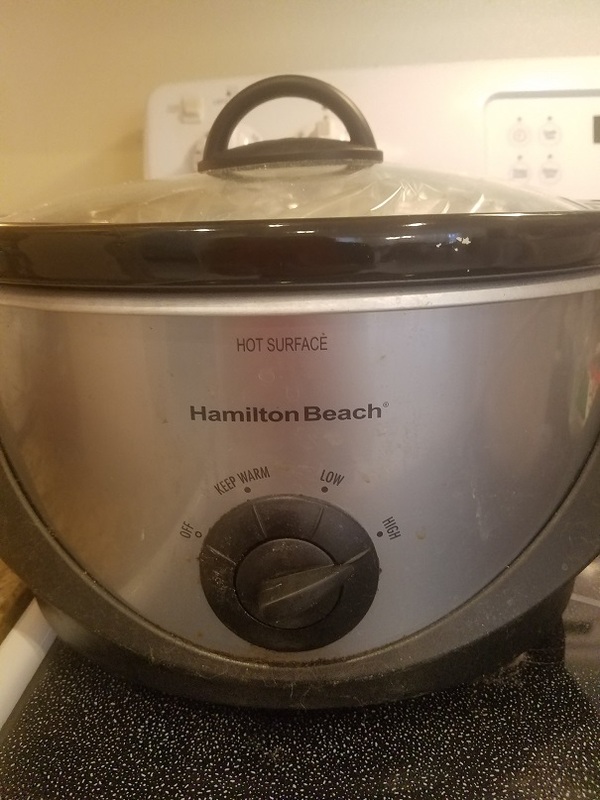 I love using my slow cooker this time of year! Oh my goodness this soup look absolutely amazing! It truly looks delicious! Yummy! This made me drool. Cannot wait to try this. Potato and Bacon sounds like a good combination. I even like the consistency of the soup. Good for my Dinner tonigt. Dang, this could be a side dish, and I'll use my fork! Yummmy!!! So delicious!! This might be our new favorite soup! !